Flip a coin. If heads, the opponent is now in love with Dawn. If tails, the opponent is now burned, paralyzed, frozen, poisoned, asleep, and confused. 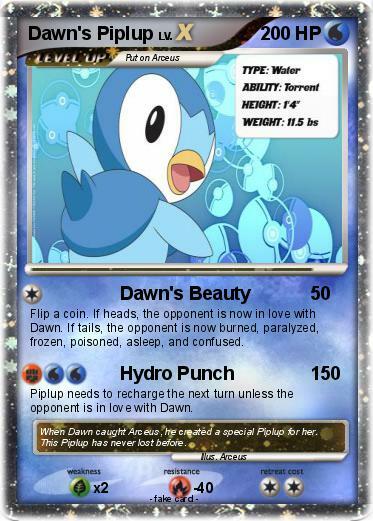 Piplup needs to recharge the next turn unless the opponent is in love with Dawn. Comments : When Dawn caught Arceus, he created a special Piplup for her. This Piplup has never lost before.